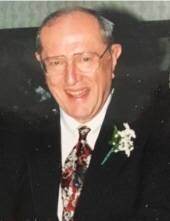 Vernon Carl Bartels, Jr, Age 82, passed away peacefully on February 3rd, 2019 at Edward Hospital in Naperville. Vern is survived by his beloved wife of 56 years, Jeanette (Roasch) Bartels, his children Sarah (Bill Nagel) Bartels, John (Stephanie) Bartels, and Sharon (Dan) Garvy, six grandchildren: Jack, Sean, Haley, Leah, Lauren, and Hannah, and his brother Roger (Lisa) Bartels. Vern could never hide the great pride he felt for his family, especially for his grandchildren. He was preceded in death by his father, Vernon Carl Bartels, Sr., mother, Anna C. Bartels, and aunt Sylvia Chvalovsky. Vernon was born on September 22nd, 1936 in Chicago and grew up in Oak Park before settling with Jeanette in Lisle to raise his family. He loved to travel, tell stories from his Denison University and Coast Guard days, and spend time with his growing family at his Lisle home, and at his vacation home in Wisconsin where he attempted to grow asparagus and enjoyed drinking Point Beer. He also enjoyed watching his children and grandchildren play sports and utilizing his distinct voice announcing wrestling tournaments and football games for Lisle High School and swim meets at the Meadows Pool, employing the talent he developed as a radio broadcaster in the 1950s. Vern capped off his professional career in sales, publishing, and marketing by working for the American Cancer Society, where he raised funds to fight cancer, a disease that took the life of his mother, and from which he was cured. Vern and his family are grateful for the many friends who have shared his life with him and those who provided dedicated care, moral support, and love in his later years. In lieu of flowers, the family asks that those friends who are healthy and willing to donate blood do so through your local blood center (www.redcrossblood.org, www.heartlandbc.org, www. Vitilant.org). Vern consumed many units during the last several weeks, and we would ask you to honor him by helping to replenish the supply to help others in need. The visitation will be held on Saturday, February 9th from 1 to 3 PM at the Friedrich-Jones Funeral Home & Cremation Services,44 S. Mill Street in Naperville. A brief memorial service will be held immediately afterwards at 3 PM. We invite you to please join the Bartels Family to celebrate Vern’s long rich life with us. To send flowers or a remembrance gift to the family of Vernon C. Bartels, please visit our Tribute Store. "Email Address" would like to share the life celebration of Vernon C. Bartels. Click on the "link" to go to share a favorite memory or leave a condolence message for the family.